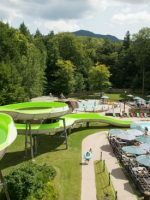 Tyler Place resort, set on 165 acres of woods, meadows and lakeshore in northern Vermont, is not just another family resort. Almost nothing about this place is ordinary — from its remarkably tasty food to its exceptionally warm staff — come prepared to be pleasantly surprised. 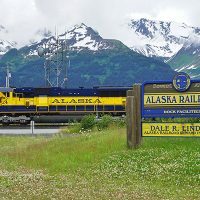 A stark contrast to mega-resorts and cookie-cutter chains, Tyler Place truly is a unique vacation experience for families. 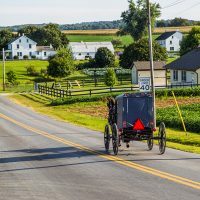 An all-inclusive waterfront property with meandering carriage houses, rustic country cottages and a top-notch children’s program, the resort offers a great escape from the modern day, bringing families back to basics by providing simple pleasures. You’ll find good company, great fun and something not easy to come by for many parents: quality time away from the kids. Indeed, one of the big draws of this resort is its terrific children’s program, which allows kids to take part in an incredible array of supervised group activities each day and evening, while allowing mom and dad time to reunite as a couple by enjoying their own grownup activities and share in intimate dinners each night. 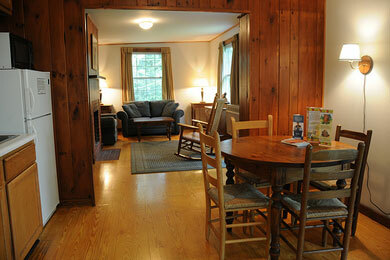 Families have a choice of staying in a cottage or family suite. Cottages and carriage houses are scattered across the property and come in several configurations from tiny to sprawling; so, be sure to ask which best suits your family. Many cottages have fireplaces and screened porches, kitchenettes and sitting rooms, and all have private baths. Cottages are comfortable but rustic. You will see critters. If you aren't comfortable with this, consider staying in a suite in the main inn. If you have small children or are not comfortable biking or walking on a regular basis, you might want to let them know you prefer to be near the main inn. 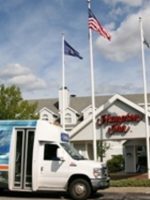 You don't necessarily need to be; you can drive, but parking near the inn is limited, especially at mealtimes. The two-bedroom cottage is more than adequate for families. It has a kitchenette with dinnerware, a small refrigerator, microwave and coffee maker. There is also a small sitting area with a couch and fireplace. Despite it being August, evenings were cool enough to make use of them. The two bedrooms were comfortable but a little tight. Cribs, high chairs, diapers, sunscreen, thermometers and over-the-counter medicines are available at the front desk, but there is no nurse or doctor on-site. The nearest hospital is about 20 minutes away. There is no room service available, and there are no televisions or phones in any accommodations. While we found no television to be a godsend, we found the lack of phone slightly annoying when we needed something from the front desk. Wi-Fi is available in the main inn, and cell phone service is generally quite good everywhere. The two-room suites in the main inn can accommodate up to six people. 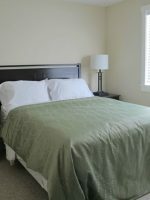 One room features a king bed and the second room features bunk or twin beds. There is a mini-fridge and small sitting area too. We're going to return this year for our third year at the Tyler Place. Our kids adore it and we love the mixture of family time and adult time. It's a simple concept- you love your kids but don't always love doing the things they do. From 8-1 your kids go to camp while you can chose from a variety of activities. At 1 you pick up your kids for family time until 5. Our kids RUN to get back to camp at 5 because they are having so much fun. Meals are adults only which is nice. Imagine a family vacation where you don't have to deal with any meltdowns, who isn't going to eat that, etc. My kids are picky eaters and have never complained about the food. Perhaps what we like the most is the friendly atmosphere and the friends that we've made at the Tyler Place. My husband is not a natural "joiner" but has somehow gotten into comradery of the place, and we've never met anyone that wasn't friendly. Our experience has also been low-key and casual. And because this is a family resort, when your kids are melting down there is zero judgement. It's refreshing. This place is definitely old school- if you're looking for a five-star resort, this isn't your place. Instead, you'll get modest accommodations in a relaxing family atmosphere. Wi-fi is available but there is a pretty strict no-cell phone in the common areas that people respect, making this one of the few times my husband and I can truly unwind. Tyler Place has made our vacations enjoyable again - for everyone. Tyler Place has a breathtaking location on gorgeous (and enormous) Lake Champlain, which means water activities abound at the resort. 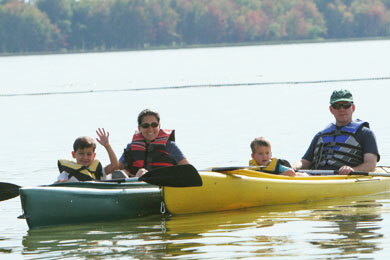 You'll find canoeing, kayaking, Hobie Cats, lake trampolines, rowboats and paddleboats, all available at no extra charge. Water-skiing, bumper-tubing and banana-boating are also available for an additional fee. A large part of the Tyler Place experience is biking. Virtually everyone either borrows or brings a bicycle, and you'll see kids of all ages riding solo or tandem with mom and dad. The bikes are not just for fun; they're a necessary means of transportation, considering how spread out the resort's grounds are. Families ride their bikes to meals, to the pool, to activities -- pretty much everywhere. 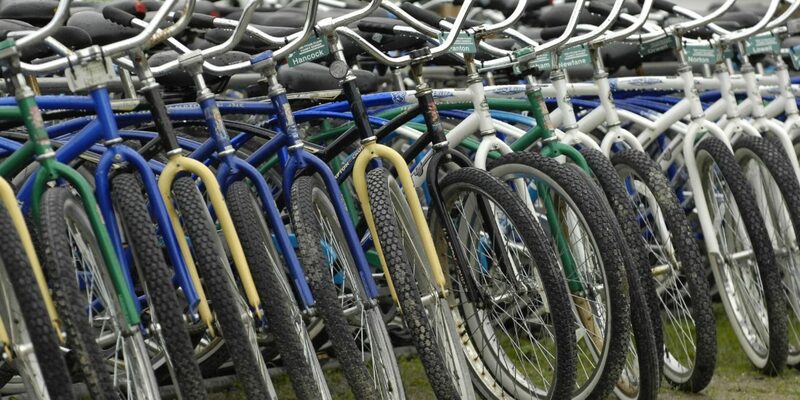 There is a sport shed near the main inn that loans out bikes and sports equipment free of charge. You'll be given a basic cruising bike for each member of your family; if you want a mountain bike with gears for longer rides off the property, you'll pay a fee. Bikes aren't required of course, but they are the preferred means of transport. Families will love the large pool area, which has indoor and outdoor heated swimming pools and a wading pool. The outdoor pool has two hot tubs and a cool splash pad with sprayers, lounge chairs, water toys, a ring toss, kick boards and inner tubes. You'll also find towels, bathrooms, changing rooms and showers. There are five playgrounds scattered across the property, offering sandboxes, tunnels, swings and slides. The kids can romp and play in the sand while the adults lounge leisurely on Aidorondack chairs on the lawn. For rainy days, the lounge off the main lobby holds a cabinet full of games and has a large screened porch with wicker furniture. The Inn's downstairs has pool tables, Ping-Pong tables, foosball, and air hockey. The field house, an adorable little building hidden in the rear of the property, has an indoor gym, fitness center and an arts-and-crafts and woodworking studio. Other activities you'll find at Tyler Place include a miniature golf course, a climbing wall, two land trampolines, multiple tennis courts, softball and soccer fields and archery. 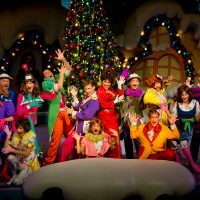 The children's program is referred to as "group" and is one of the most well-orchestrated, fun, innovative programs we have experienced at any resort. The program runs for most of the day, so plan on being away from your kids from 8:30 a.m. until 1:30 p.m. and again from 5:30 p.m. until about 8:30 p.m. Kids are divided into several age groups: 2.5- and 3-year-olds, 4- and 5-year-olds, 6- and 7-year-olds, 8- and 9-year-olds, pre-teens 10 to 12 and teens 13 to 15. Children 16 and older have no organized group. Childcare programs are available for infants (newborn to 12 months) and toddlers (12 to 18 months and 18 to 30 months) for a fee. My 2.5-year-old, who is somewhat apprehensive about leaving mom, was literally swept from my hands the first evening into a bright and welcoming room with soft red couches, crafts, books and games. Bubbles filled the air, and smiling counselors who clearly love what they do tended to eager children. My 7-year-old son fared equally well and was greeted with high-fives and secret handshakes by the knowing staff. My daughter was sung to on wagon rides around the property, had swim time and went on nature walks, while my son played numerous sports, did a really cool pirate scavenger hunt and took a boat ride across the lake. 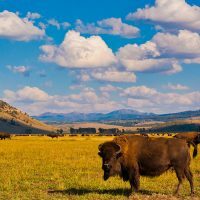 For children who do well away from mom and dad and for parents who appreciate lots of kid-free time on vacation, this is ideal. However, for parents who want to spend a majority of time with their children on a vacation, we'll be frank: This is not the resort for you. Kids eat all meals in group and are not permitted in the dining room, with the exception of breakfast, when they can eat in a separate room off the main dining room with mom and dad. While kids are in the morning sessions of their programs, adults can choose from a variety of classes and tours, including yoga and guided canoe and kayak trips. Babysitting is available for a fee after the evening group session ends for parents wishing to have an evening out. There are also live music, bonfires and other late-night activities. There is more than enough to do on the property to keep families entertained; but, if you're looking to venture out, we highly recommend a bike ride across the border to Canada. The 10-mile trip was a highlight of our visit. It was a serene and not-too-strenuous ride and such fun crossing through customs on two wheels with our passports in our back pockets. (Yes, if you plan on crossing the border, you WILL need your passport.) We glided into the nearest town, quaint little Philipsburg, where we lounged at a lakefront bistro and partook in a little wine and cheese before pedaling back to the resort. The food at Tyler Place is excellent. Everything is fresh and delicious, and we especially appreciated the large variety of healthy and vegetarian options. Much of the produce comes from local farms, and you can tell much care goes into the menu and its preparation. Dishes include butternut squash salad, roast prime rib of beef, thyme chicken, lobster and sweet-potato curry. And for the kids, there are pancakes, hamburgers, macaroni and cheese, pizza and fruit kebobs. All meals are served buffet-style in the main dining room of the inn, a room which, as previously mentioned, is off-limits to children. There are three separate sitting areas in the main dining room and an outside deck that overlooks the lake. You'll need to put your name in to reserve a table outside, and you should definitely do so. Kids will eat all three meals with their groups, an arrangement which we quickly discovered appeals to pretty much all families visiting Tyler Place and makes for a leisurely, quiet, elegant dining experience, particularly at dinnertime. Kids are permitted in a separate back area of the dining room during breakfast, but we rarely saw people take advantage of this. If you prefer dining as a family all together, or if your children are on the fence about being in group until 8:30 p.m., this arrangement has the potential to pose a major problem for your family. You can request a carry-out dinner, which they pack neatly into a picnic basket for you to eat in your room -- but doing this every night would get old pretty quickly. As is the case with most all-inclusive resorts, dining is communal. There are tables for two, but if you do not request them, chances are you will be seated at a table with other families. 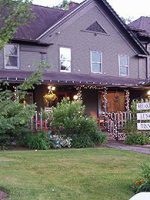 This is all part of the Tyler Place experience: Intimate dinners, a warm and cozy inn and the quiet seclusion of the place all combine to create a sense of camaraderie and friendship among guests. For first-timers, the staff go out of their way to make sure you are comfortable, making introductions among guests and joining in conversations. 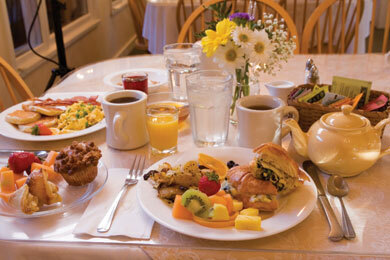 All meals are included in the all-inclusive rates at Tyler Place. Alcoholic beverages are not, with the exception of a welcome cocktail. Stock up on snacks, sodas and wine at the convenience store near the entrance to the resort. 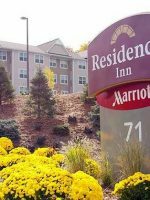 You can get just about anything there, from sewing kits and Band Aids to beer and cheese. .
Wi-Fi is available in the main inn, and cell phone service is generally quite good everywhere. Babysitters are available for in-room sitting for an additional fee. 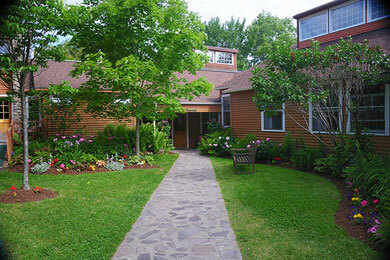 Tyler Place is open from the end of May through the beginning of September. Many families return year after year and choose the same the week to be with friends they have made. If you know there is a particular week you are interested in, book as far in advance as possible. The weeks before school ends in May and June and after school starts in early September are less expensive and offer special activities geared toward younger children. Part of the appeal of Tyler Place is its seclusion. But this can mean it's a bit of a hike for many families. Despite being somewhat remote, it's still very accessible, just off I-89 and I-87. If you are near enough to drive, we highly recommend it. It's beautiful country. 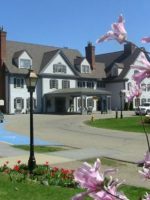 The nearest airport is Burlington International Airport, which is about a 45-minute drive from Tyler Place. If you want to venture into Canada, don't forget your passport. There is a small duty-free store about five minutes from the resort -- great for souvenirs. The resort is easy to get around on foot. Parents will have plenty of free time while the kids are in group to enjoy their own activities like golfing and kayaking.